How do I set up my email settings in inFlow Cloud? You can quickly send documents to your customers / vendors by emailing with inFlow Cloud. Each user in your system will be able to set up their own email settings. inFlow Cloud for Windows now allows you to send emails without any setup! Follow the steps in this article to start sending emails. Reply-To: Replies to emails you send through inFlow Cloud will be sent to this address. If you don’t change this email, it’ll default to your inFlow team member email. Default Cc: Add one or more email addresses here, separated by commas, to pre-fill the carbon copy field in the send email window. Default Bcc: Add one or more email addresses here, separated by commas, to pre-fill the blind carbon copy field in the send email window. To change user logins so you can set up your email, go to Main Menu > General > Log Out, then log in using your user information. 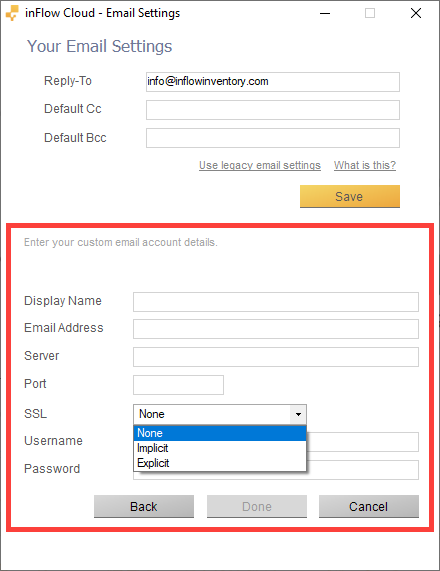 To change your email settings from inFlow Cloud for Web, first log into app.inflowinventory.com with your inFlow Cloud team member account. Then click on the menu icon in the top left and choose Options > Manage my account. Find the Email Settings section and click on Update my email settings. Once you’ve done that you’ll be able to edit your email settings from either app. 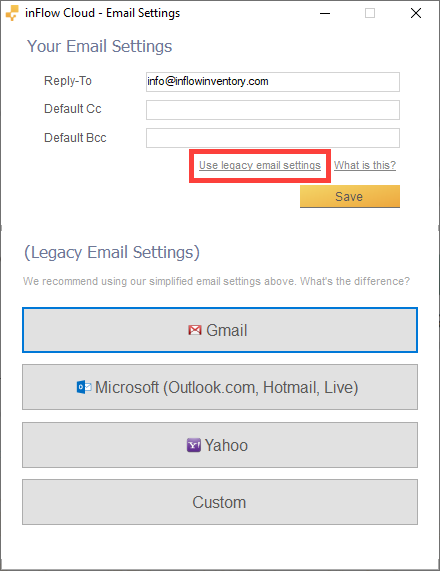 Legacy email settings are still available in inFlow Cloud, however we recommend using the new email settings, which are easier to set up and more reliable. Steps for switching from legacy settings to the new settings can be found here. Note: inFlow only supports SMTP email protocols. Email servers that use any other protocol are not compatible with our system (e.g. Microsoft Exchange). To change user logins so you can set up the email, go to Main Menu > General > Change User and then log in using your user information. If your email address ends in gmail.com, pick the Gmail option. If your email address ends in outlook.com, hotmail.com , live.com or msn.com, pick the Microsoft option. If your email address ends in yahoo.com, ymail.com, pick the Yahoo option. After selecting any one of the options above you’ll be asked to enter your email address and password. Server: This is the hostname of the SMTP mail server (outgoing) used by your email service provider. Port: This is the port used by the SMTP server (usually 465, 587, or 25). If you know that your SMTP server doesn’t use encryption, select the None option. This option is unrelated to the port number. Username: This is your username (usually email address) to access your email. Password: This is the password required for accessing your email. If you use a program like Outlook or Thunderbird to open your mail, then you can find the server settings through the program as well. 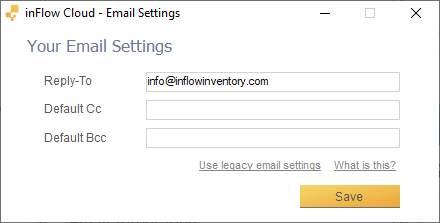 inFlow Cloud’s new email settings use a cloud server to send emails on your behalf without requiring any setup! You can customize which address you want any replies to these emails to be sent to. If you don’t customize the reply-to address, replies will be sent to your inFlow Cloud team member account email by default. 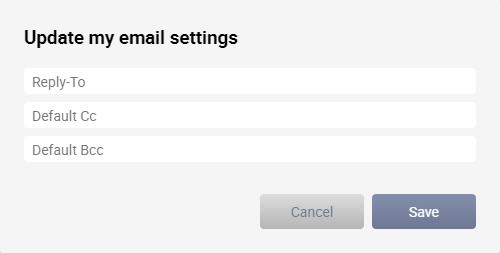 The new email settings also allow you to set default Cc and Bcc addresses that will be automatically filled into the Cc and Bcc fields when you send an email in inFlow Cloud. inFlow Cloud’s legacy email settings use SMTP to send email using your email provider’s mail servers. This requires you to enter detailed technical information about your email provider’s mail server into inFlow, and if anything is entered incorrectly, your emails will fail to send. The legacy settings also use older protocols to contact your provider’s mail server, which can cause emails to fail to send. It’s possible to enable settings in your email account to make it work with the older protocol, but doing this makes your email account less secure. We advise using the new email settings in inFlow Cloud, which are simpler, more reliable, and more secure than the legacy settings.